Video Output - Development - SMS Power! 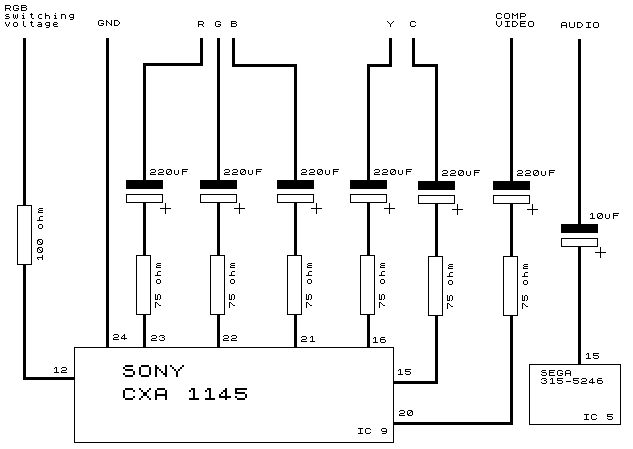 The Sony CXA 1145 video chip has RGB, S-video and composite outputs. You can connect any or all of these in your mod. For S-Video, use any generic NPN transistor and a 33 ohm resistor. Connect the CXA1145P output into the transistor's base (Pin 15 and 16), connect +5v to the collector (Pin 12), and connect the transistor's emitter to the resistor. The other end of the resistor goes to your monitor. Attach your grounds to Pin 24 or any other ground point on the board (such as the RF box shielding). For RGB, you will need a connection to be present for sync. Most monitors will accept the composite video signal (CXA1145 pin 20) for this. Some require a true composite sync signal - this can be obtained from pin 11. 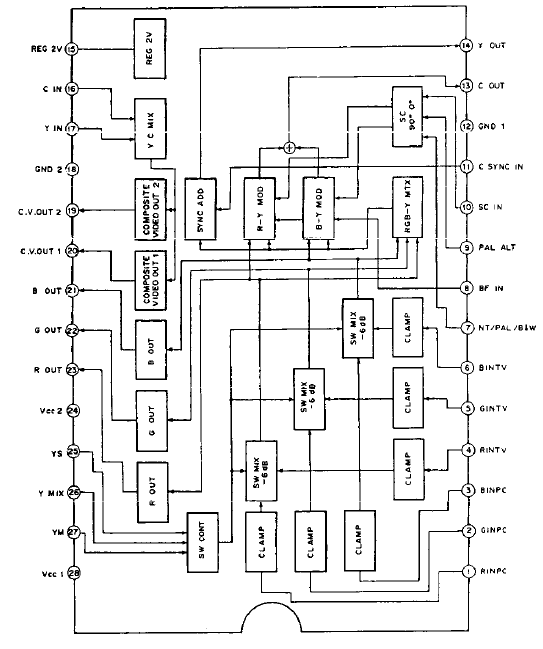 As shown on the schematic, the video connections are obtained from various pins on the Master System's CXA 1145 encoder chip. You can solder wires directly to the legs of the chip - the pin numbers are printed on the Master System's motherboard, in case you're unsure. Finally the GND and switching voltage connections can be obtained from any ground and +5v points on the board, respectively. Pins 24 and 12 respectively of the CXA 1145 are suitable. The original Master System I has a slightly different chip, but the concept is still the same. For Composite Video solder to Pin 19 or 20 and attach your grounds to Pin 12 or 18 or any other ground point on the board (such as the RF box shielding). For S-Video, use any generic NPN transistor and a 33 ohm resistor. Connect the V7040 output into the transistor's base (Pin 13 and 14), connect +5v to the collector (Pin 28 or 24), and connect the transistor's emitter to the resistor. The other end of the resistor goes to your monitor. Attach your grounds to Pin 12 or 18 or any other ground point on the board (such as the RF box shielding). For RGB, refer to the CXA1145P mod, but instead solder Red to Pin 23, Green to Pin 22, and Blue to Pin 21. Solder the RGB Switching Voltage with a 100 ohm resistor to Pin 28 or 24. Attach your grounds to Pin 12 or 18 or any other ground point on the board (such as the RF box shielding).